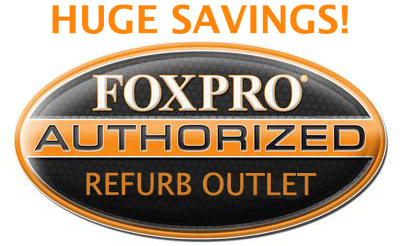 SAVE BIG on FOXPRO Factory Refurbished Units! AllPredatorCalls.com is a prestigious Platinum Level FOXPRO Retailer, and the highest volume single store FOXPRO stocking retailer in the nation for 2006, 2007, 2008, 2009, 2010, 2011, 2012, 2013, 2014, 2015, 2016, 2017, and 2018! Not only are we an Authorized Refurbished Unit Outlet, we are also a FOXPRO Factory Authorized Sound Programming Facility and offer the unique ability to program any FOXPRO model with the FOXPRO library of over 400+ wildlife calls. FREE Custom Sound Programming! YOU PICK the calls of YOUR CHOICE - WE PROGRAM Your Call!